“I thank the Rhode Island House for passing this resolution in support of Karabakh’s aspirations for freedom, and hope that the legislature’s commitment to our shared values of human rights and justice will set an example for other legislatures in the U.S. and beyond,” said Robert Avetisyan, the permanent representative of NKR to the U.S. and Canada. The resolution was voted on the House floor in the presence of Avetisyan, whom House speaker Gordon Fox (D) warmly welcomed in his introductory remarks. Fox also welcomed a delegation from the local Armenian community accompanying Avetisyan: Chairman of the Armenian Cultural Association of R.I. Hagop Donoyan, youth advisor to the AYF of R.I. Levon Attarian, member of the board of trustees of the Sts. Vartanantz Church Stephen Elmasian, and member of the ARF Eastern U.S. Central Committee Ani Haroian. 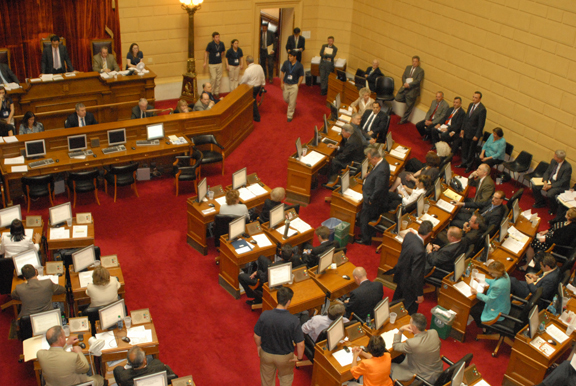 Dozens of local Armenian-Americans filled the gallery of the House during the session. Almost concurrently, on Capitol Hill, Congressmen James Langevin (D-R.I.) and Congressman David Cicilline (D-R.I.) made statements on the House floor in support of the people of NKR. Senators Sheldon Whitehouse (D-R.I.) and Jack Reed (D-R.I.), in turn, issued statements. Representative Avetisyan will continue his meetings in Rhode Island over the next several days, pursuing economic development opportunities for NKR. His visit will conclude on May 20 with a community-wide celebration of the 20th anniversary of the liberation of Shushi.